The Innate Mind: Structure and Contents. Edited by Peter Carruthers, Stephen Laurence, and Stephen Stich, 441pp. (Oxford University Press, 2005). 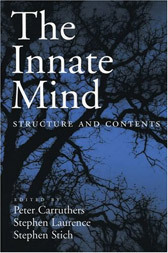 This is the first volume of a projected three-volume set on the subject of innateness, based on the AHRC Innateness and the Structure of the Mind Project. The extent to which the mind is innate is one of the central questions in the human sciences, with important implications for many surrounding debates. By bringing together the top nativist scholars in philosophy, psychology, and allied disciplines these volumes provide a comprehensive assessment of nativist thought and a definitive reference point for future nativist inquiry. The Innate Mind: Structure and Contents concerns the fundamental architecture of the mind, addressing such questions as: What capacities, processes, representations, biases, and connnections are innate? How do these innate elements feed into a story about the development of our mature cognitive capacities, and which of them are shared with other members of the animal kingdom? The editors have provided an introduction giving some of the background to the debates about innateness and introducing each of the subsequent essays, as well as a consolidated bibliography that will be a valuable reference resource for all those interested in this area. The volume will be of great importance to all researchers and students interested in the fundamental nature and powers of the human mind. “This is a terrific collection. It's not just a survey of the terrain, though it is that; it also contains a number of papers that push the boundaries and make major new contributions to several hot debates in cognitive science… I predict that the book will become a must-have collection, not just for all participants in these fields, but also for those not working in these areas and desiring a comprehensive and accessible guide to the issues.” — Fiona Cowie, California Institute of Technology, and author of What's Within: Nativism Reconsidered. Tom Simpson, Peter Carruthers, Stephen Laurence, and Stephen Stich. Introduction: Nativism Past and Present. Gary F. Marcus. What Developmental Biology Can Tell Us about Innateness. Brian J. Scholl. Innateness and (Bayesian) Visual Perception: Reconciling Nativism and Development. Dan Sperber. Modularity and Relevance: How Can a Massively Modular Mind Be Flexible and Context-Sensitive? Peter Carruthers. Distinctively Human Thinking: Modular Precursors and Components. Anna Shusterman and Elizabeth Spelke. Language and the Development of Spatial Reasoning. Richard Samuels. The Complexity of Cognition: Tractability Arguments for Massive Modularity. Tom Simpson. Toward a Reasonable Nativism. Scott Atran. Strong versus Weak Adaptationism in Cognition and Language. Mark C. Baker. The Innate Endowment for Language: Underspecified or Overspecified? Stephen Crain, Andrea Gualmini, and Paul Pietroski. Brass Tacks in Linguistic Theory: Innate Grammatical Principles. Susan A. Gelman. Two Insights about Naming in the Preschool Child. Stephen Laurence and Eric Margolis. Number and Natural Language. Daniel J. Povinelli, Christopher G. Prince, and Todd M. Preuss. Parent-Offspring Conflict and the Development of Social Understanding. Susan C. Johnson. Reasoning about Intentionality in Preverbal Infants. Helen Tager-Flusberg. What Neurodevelopmental Disorders Can Reveal about Cognitive Architecture: The Example of Theory of Mind. Joshua D. Duntley and David M. Buss. The Plausibility of Adaptations for Homicide. John Tooby, Leda Cosmides, and H. Clark Barrett. Resolving the Debate on Innate Ideas: Learnability Constraints and the Evolved Interpenetration of Motivational and Conceptual Functions. Joshua Greene. Cognitive Neuroscience and the Structure of the Moral Mind. Shaun Nichols. Innateness and Moral Psychology.